Technical analysis is the key knowledge of successful trading. Whether you are a beginner or an experienced trader, sound technical knowledge is equally important for you to get the maximum return of investment. With the right knowledge of market behaviours, one can easily predict and judge the market scenario and position of his or her invested stocks. It is the right technical analysis of the market and right prediction of its movements that gives the investor and trader higher margins of profitability. With experience and time one gets to expertise their skills of technical analysis, but for a beginner, it is extremely important to know and learn the basics well. Based on the right basic only can one move forward. However, it is equally important to keep learning or else stagnant knowledge can be really detrimental at times. Get a book: famous investors and traders who are now also investment guides have written a various book in accordance with their expertise. One can always get hold of such books and gain knowledge through self-teaching. Attend special shows: there are various television shows that give one an idea and major notable points of online trading. These shows bring to you the whole market in points. These shows are a great way of learning technical analysis but only for those who already have vast knowledge and just need a little bit to brush up. Attend online courses: there are several online courses available which provide you with soft copies of lectures and seminars so as to help you learn the topics on your own at your own free time. Attend ProRSI courses: All the above ways are good, but nothing can beat a real hand on practical class. That is exactly what ProRSI brings to you. The technical Gurus at ProRSI know and understand how important is to start from the zero. ProRSI thereby has come up with various kinds of courses depending on the level of knowledge. 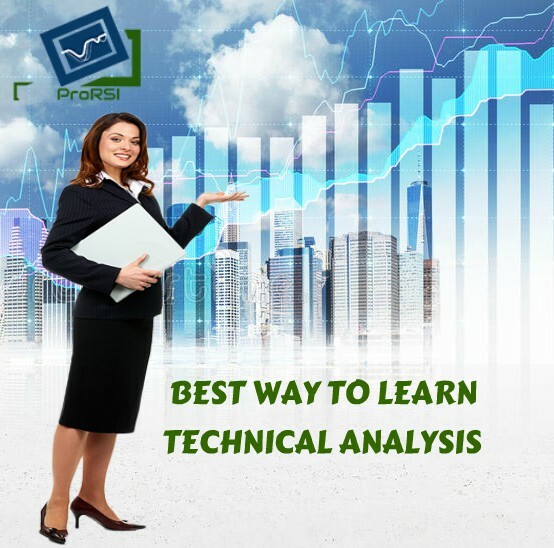 “A Beginners’ Guide to Technical Analysis Course” is the basic course which introduces the basic of technical analysis to the attendee. There are several other courses designed focussing the other increasing level of analysis. ProRSi courses are conducted by industry experts who have vast knowledge and experience of the market trends, highs and lows. Thus they are the best people to help one take the right decisions with the help of the right analysis. Other than this, there is a scope of practically developing one’s skills as all these courses are conducted during the market hours so that one can immediately apply their knowledge and trade accordingly. There is ample scope of discussion and doubt clearing. This gives the attendee the chance to ask any question and query they have directly to the expert. All these courses are conducted with limited seats in order to promote more one on one discussion. ProRSI regularly conducts such courses in order to suit your time and need. Thus these small moves can help you learn the right business skills in order to get the maximum profit in the lowest possible time and investment.